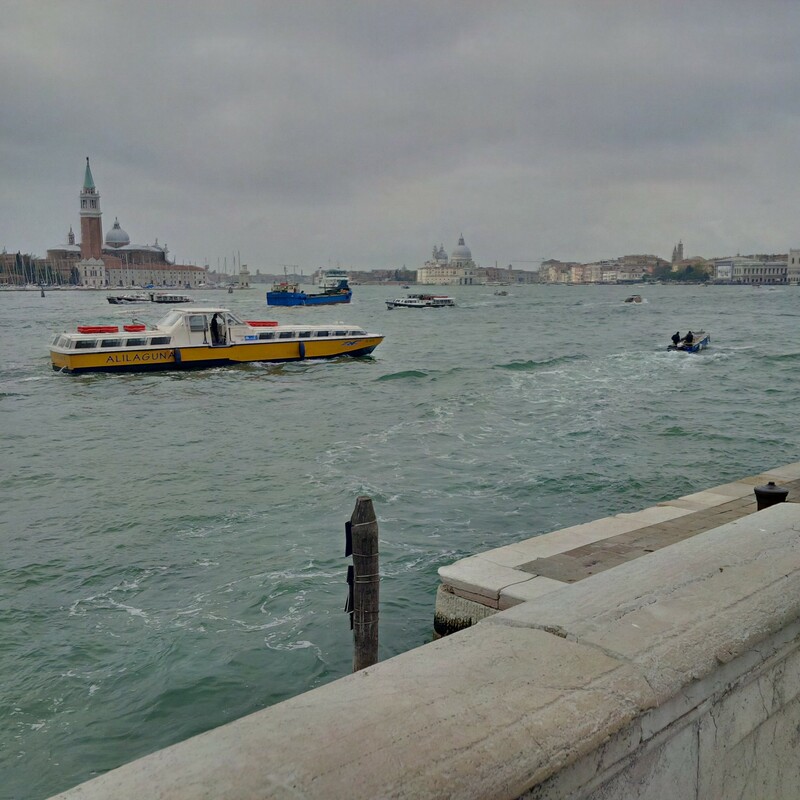 So the ride in from Marco Polo Airport takes longer than I anticipate, the boat is slow and I take ages to get to my lovely hotel (The Hotel Monaco) which is next to Piazza San Marco and situated on the Grand Canal itself. The view around the hotel is amazing (first picture is the view from the front of the hotel). I haven’t eaten and have had a handful of hours of sleep and a major timezone change. So I decide I need some dinner and when in town you always need to go to your home, which is Harry’s Bar. I head off to Harry’s for dinner. Now Harry’s is truly a Venetian institution. Here’s a little history of place which will give you some background. 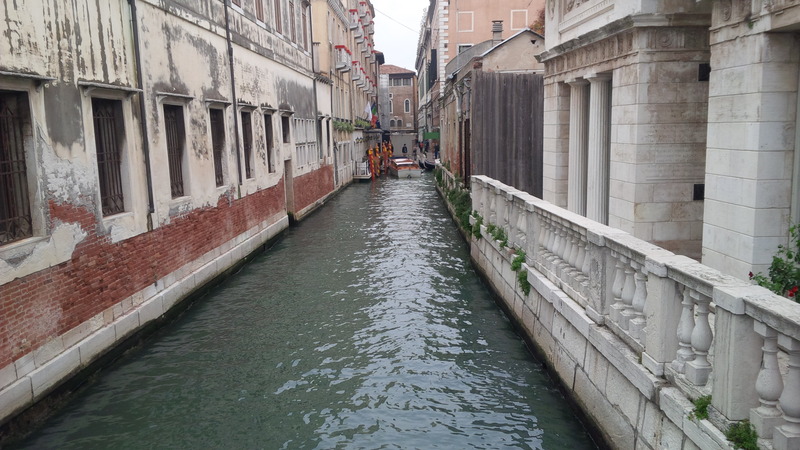 In the fall of 1929, Giuseppe Cipriani, a barman at the Hotel Europa in Venice met an American student named Harry. Harry was a regular at the bar (Harry was actually in Venice to cure his alcoholism). 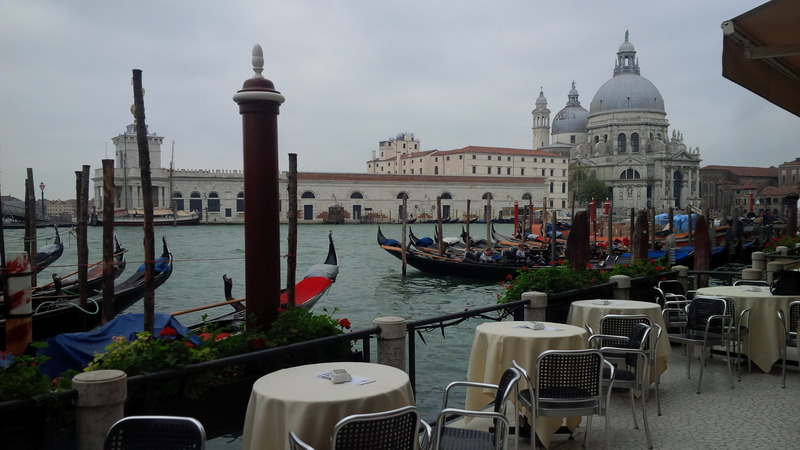 Giuseppe had serious doubts spending time in Venice would cure him, as he spent entire days at the bar in Hotel Europa. Harry fell out with his aunt (who was funding his drinking habits). 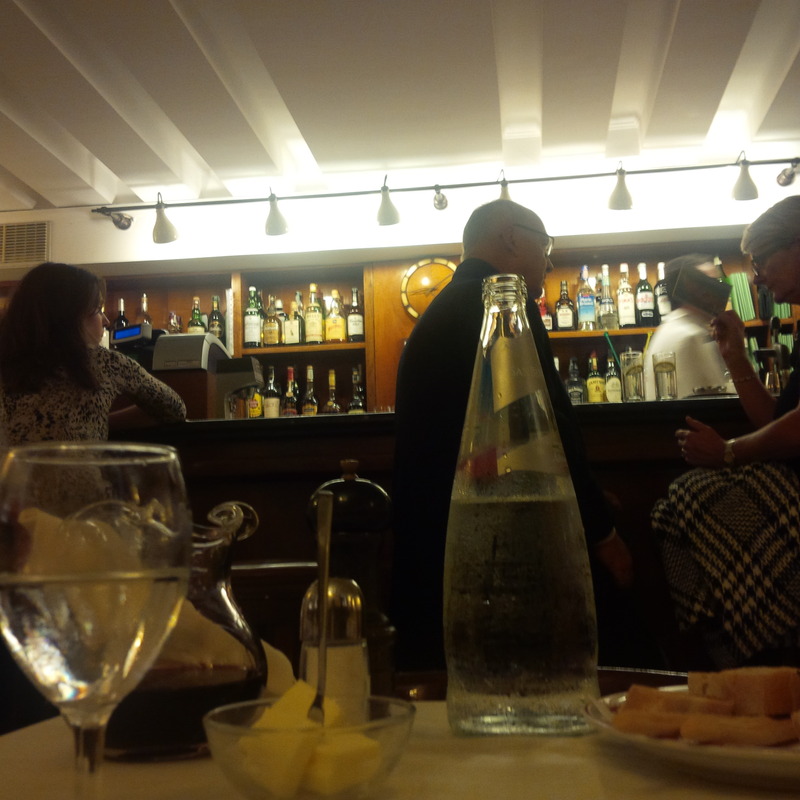 Harry stopped drinking and strapped for cash, Harry hit Cipriani up for 10,000 lire. Cipriani loaned him the funds and Harry disappeared. Cipriani was worried that he’d never see his money again. However, Harry returned in February 1930, and he not only repaid Cipriani but offered to put up 40,000 lire for the pair to set up their own place. He asked for the place to be called Harry’s Bar. The following year they opened Harry’s Bar in an old warehouse at near the Piazza San Marco. The decor was nautical and simple, the service elegant but seemingly effortless. And writers and other tastemakers found it a comfortable watering hole. By the 1950s Harry’s Bar had become a place where European nobility and other jet-setters mingled (Charlie Chaplin, Ernest Hemmingway, Noel Coward to name a few). Harry’s Bar was so integral to fabric of Venice, that when World War II ended, the U.S. commander of the Allied forces summoned Cipriani and told “You are not a good Italian,” Cipriani worried, responded “Why?” he asked. “Because you have not reopened Harry’s Bar.” Harry’s Bar has prided itself on service and today is no different. 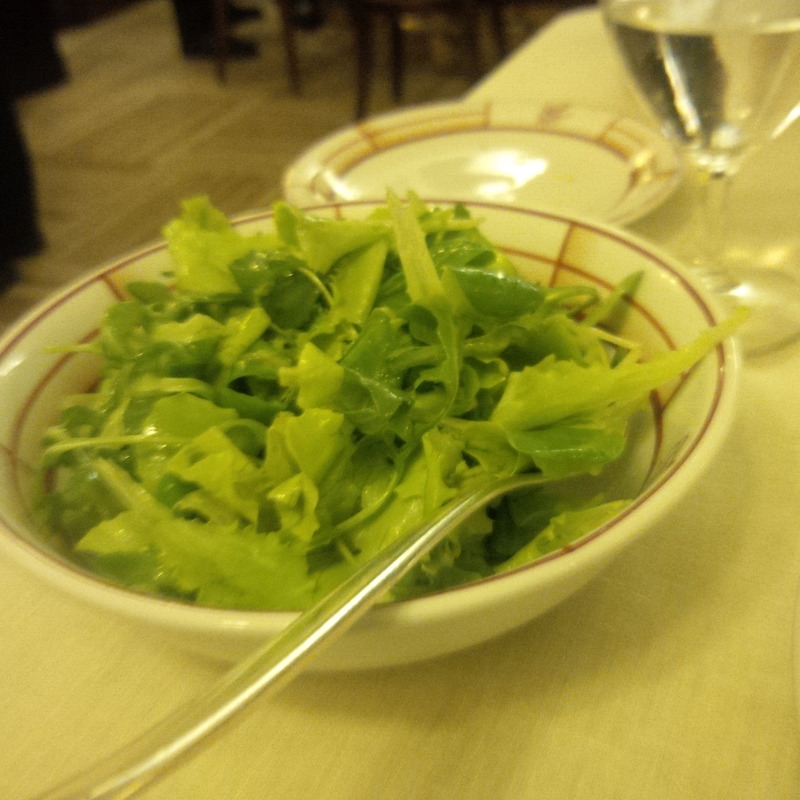 Now, back to my dinner…I walk into Harry’s and there is a lovely Italian girl who greets me at the door. The host finds me a table and I am seated. 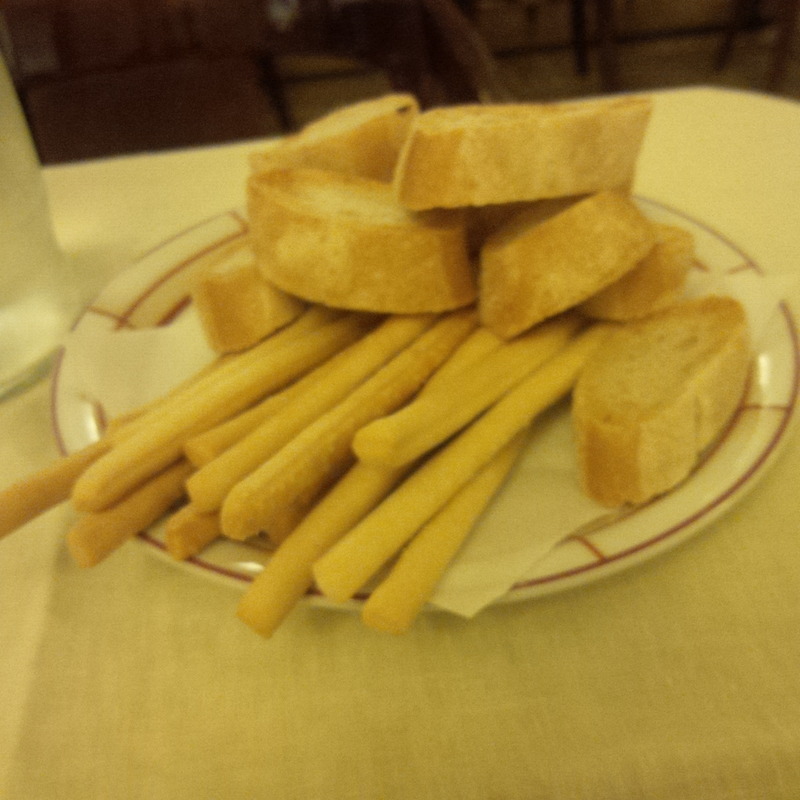 Complimentary bread sticks and soft bread are brought to the table. 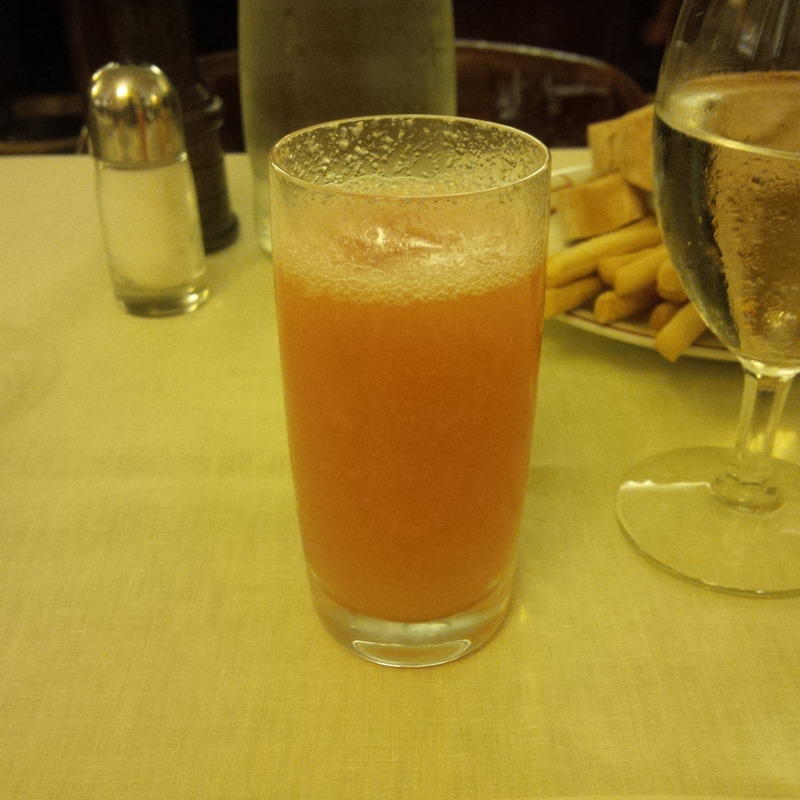 I speak to the waiter about an aperitif, I have to go for the Bellini (which was invented here, which is a whole other story). I sip the Bellini slowly and the grainy texture of the stone peach puree, the bubbles from the prosseco just form a dance on my tongue, I gaze around and take in the view this historic bar and I am in heaven. 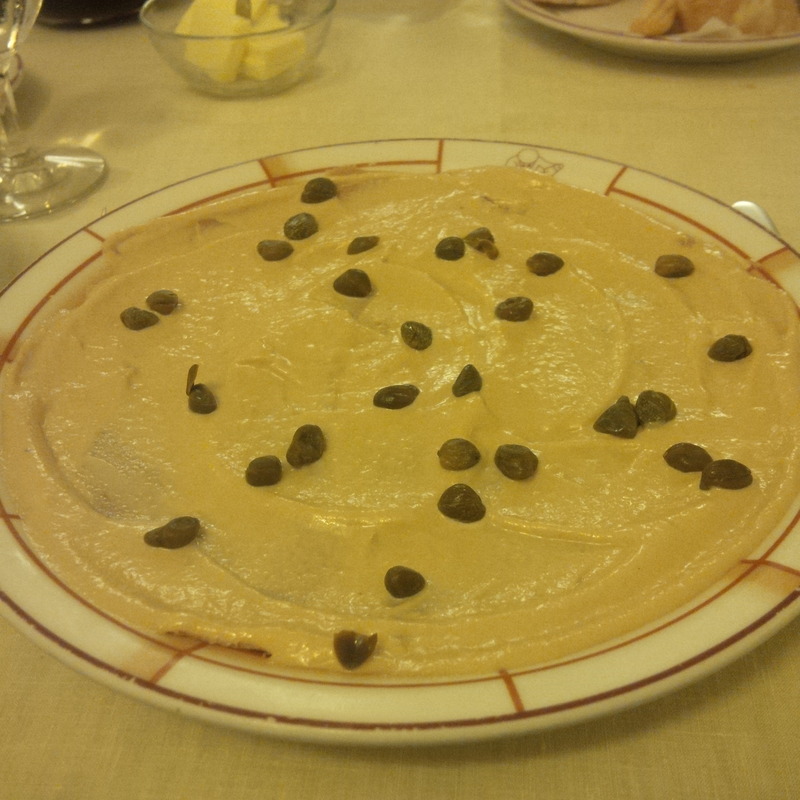 I am brought my starter a veal ravioli. 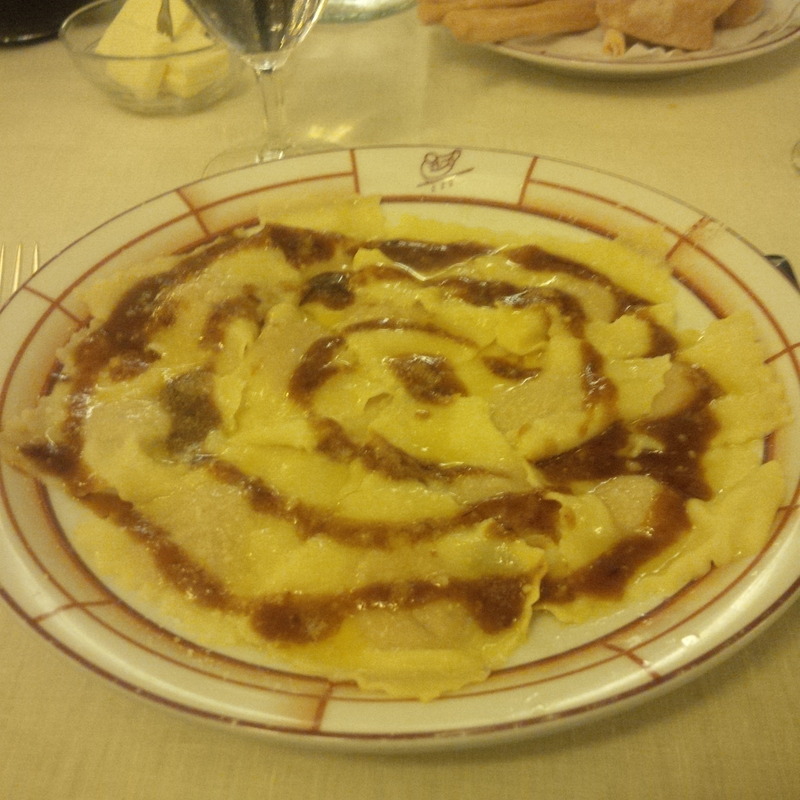 Fine pieces of ravioli with veal meat and a ragu sauce on top. The ravioli is so thin and soft, it melts on your tongue to reveal the veal filling: a soft salty shredded meat full of flavour. This is amazing! 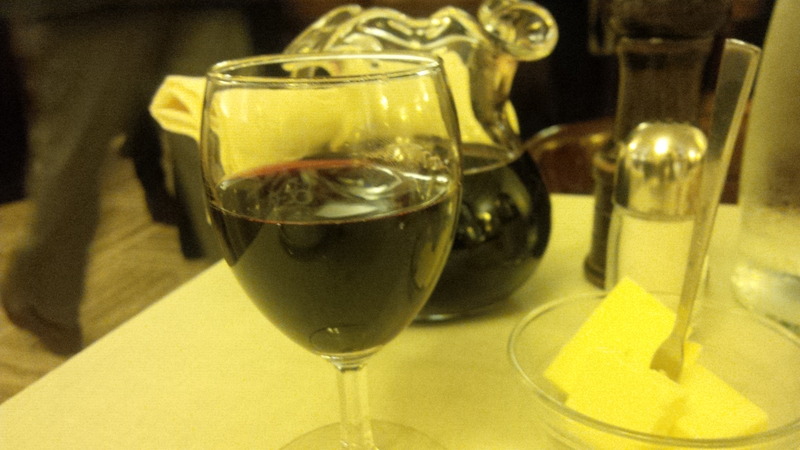 I commence with a carafe of Cabernet Sauvignon which pairs perfectly with both the entrée and main course. Veal with a tuna sauce, sprinkled with capers. The tuna sauce is smooth and creamy, although you can taste the bits of tuna brine which pairs perfectly with soft veal carpaccio and the tang of the capers. I simply couldn’t be happier. 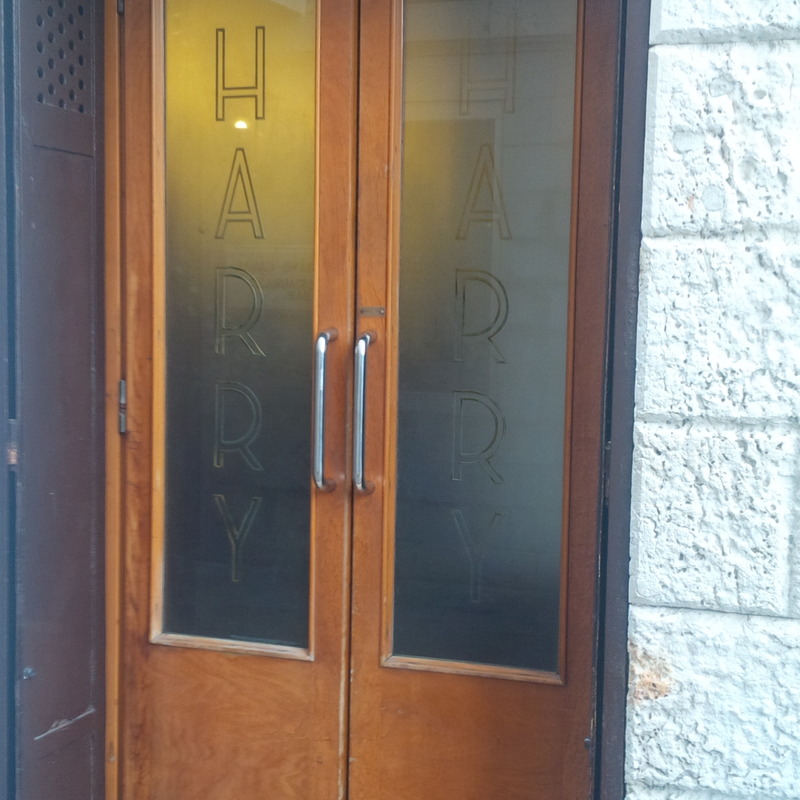 Which leads me to reflect on Harry’s Bar, why should Harry’s still be around? Restaurants are victims of trends, they open and close every five years, so what’s special about Harry’s? Yes, it’s an institution, but who cares? As I reflect on this, it occurs to me. Institutions connect the ancestors to their descendants. Timeless values, culture and attitudes are passed from generation to generation through institutions. The source of Harry’s Bar was the hospitality shown by a barman (Cipriani) to an American student who was a customer (Harry). At Harry’s those values are true even today. 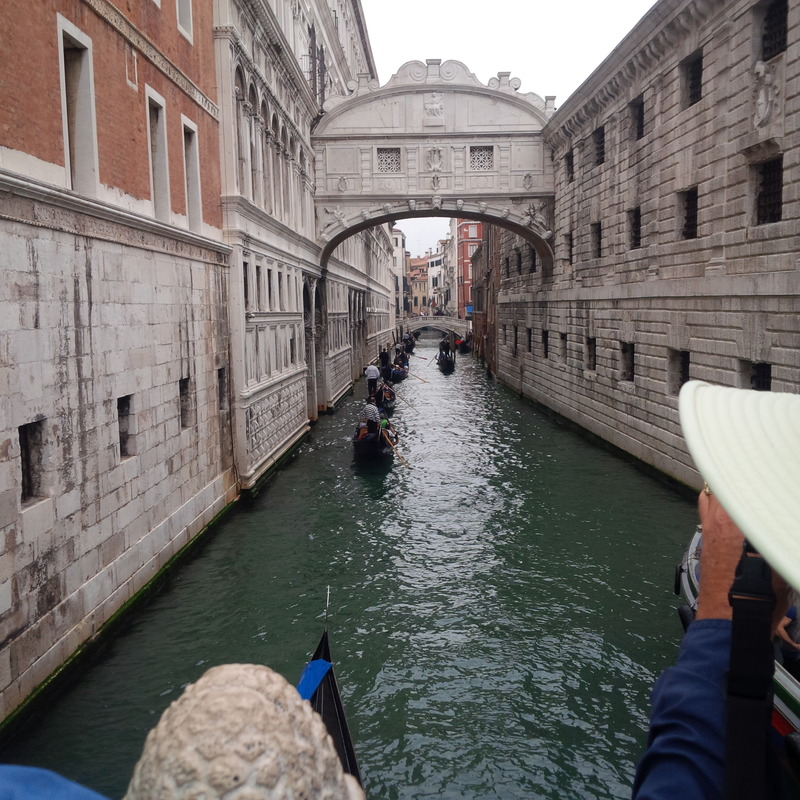 Whether you are an American tourist looking to try a Bellini to say you’ve been to Harry’s, an old Venetian family, a European aristocrat or a hedonistic foodie, you are treated with the same warm hospitality, generosity and kindness Mr Ciprani showed to Harry. It’s timeless. I look around the bar and every customer is being looked after, they are all excited and very content. As I finish my reflection, I go to sip my wine and notice there is a tiny spill on table cloth. I can live it, but the staff notice too and within a couple of minutes, a new table cloth is immediately brought out to replace the old. The service is flawless, my glass is never empty, every small need is attended to, and attention to detail is the order of the day. 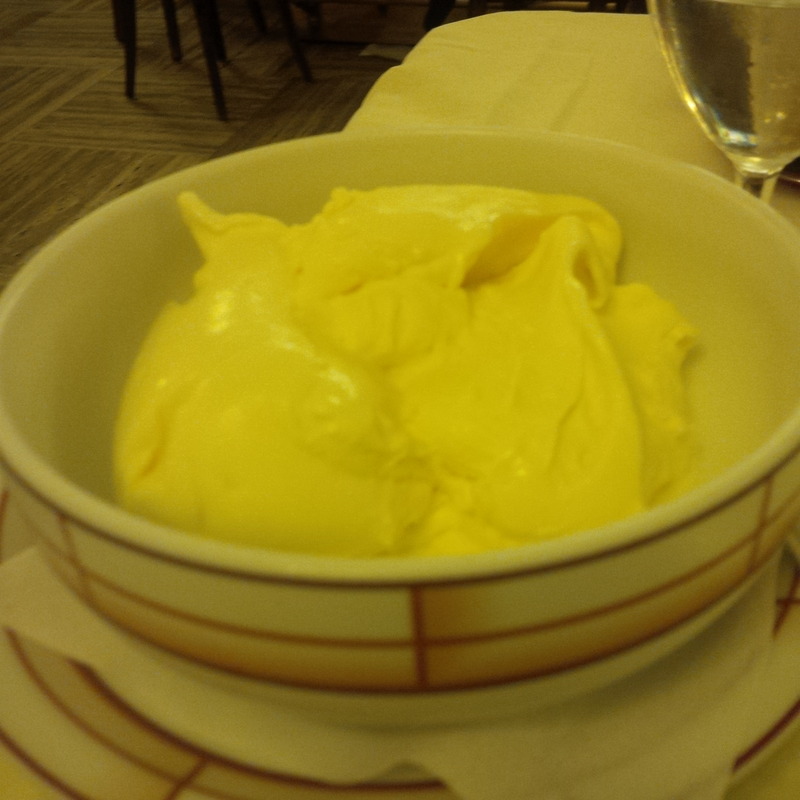 The waiter recommends I try a homemade vanilla ice cream for dessert. I agree. The ice cream is fantastic, simply flawless. It’s creamy with that distinct vanilla bean taste. 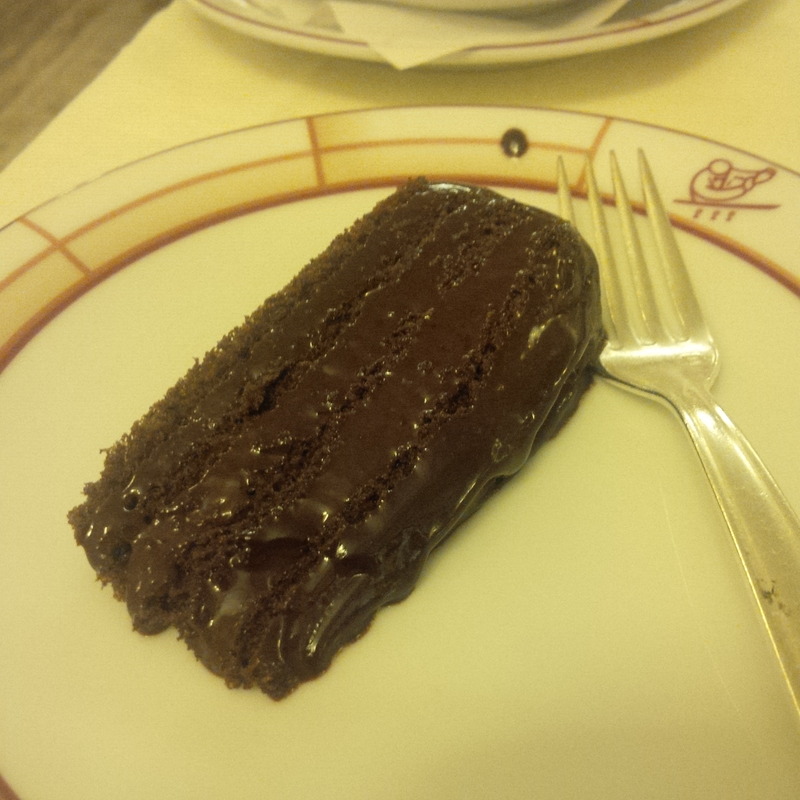 The waiter laments that the ice cream (as good as it is on its own) really should be paired with a small chocolate cake. He brings a complimentary slice for me to taste. This is Harry’s way. I attempt to top-up my wine glass (it’s not empty, in fact on reflection it wasn’t that low). The waiter looks in horror and races over from the front of the bar, gently taking the carafe out of my hand and pouring it for me. The laws of Harry’s customer service have no small exceptions. 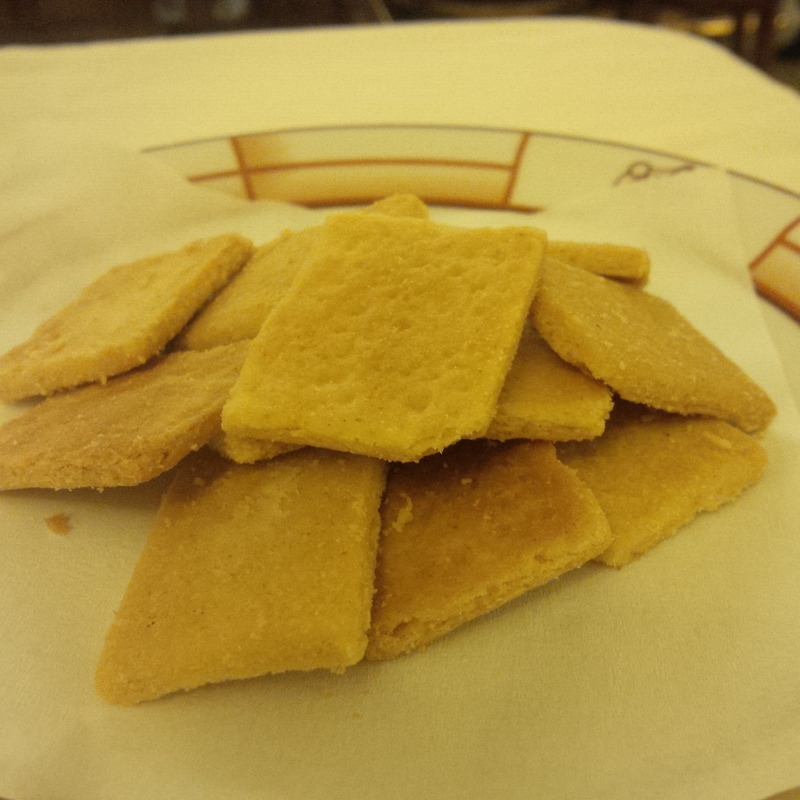 I finish with some complimentary vanilla shortbread and a coffee. I have paid the bill and am about to leave; and the waiter still tops up my water glass… Harry’s way is well and truly alive to this day. I wasn’t a customer today, I was part of their family. 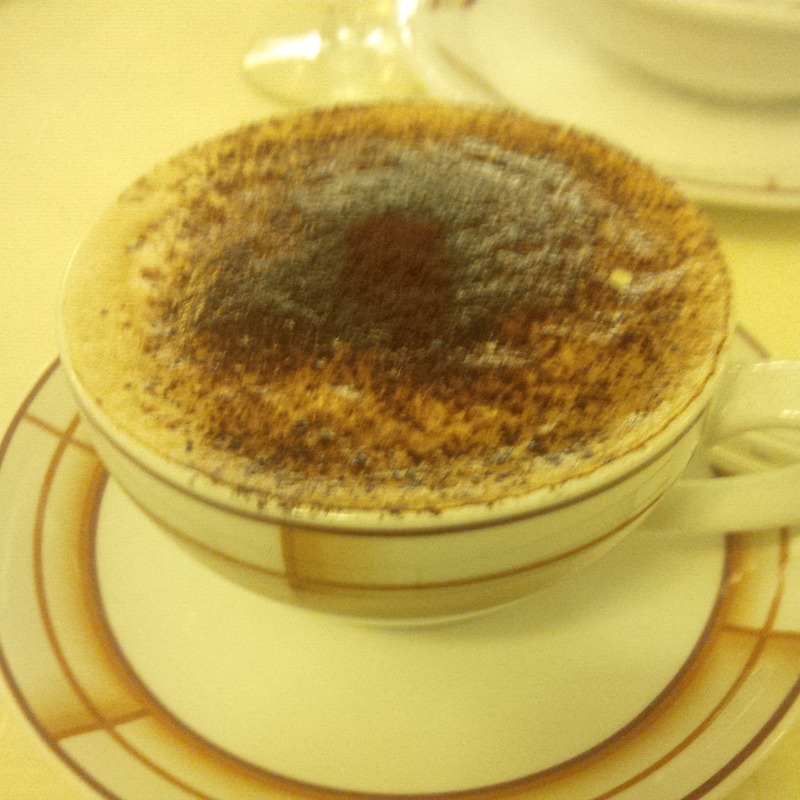 As for hospitality, Italians are hard to beat. Agreed! Harry’s is second to none! I try to stick to my mantra of TASTE ONLY. But when you eat out every day, like I guess you & I do, service becomes such a huge factor. Hopefully I’ll get to go back to Venice one day & search out Harry’s for myself!